This explanation might seem compelling at first. It is true, after all, that globalisation has fundamentally transformed economies, sending low-skill jobs to the developing world – a point that populist personalities never tire of highlighting. Moreover, educational attainment correlates strongly with income and labour-market performance. Almost everywhere, those with a university degree are much less likely to be unemployed than those without a secondary education. In Europe, those with a graduate degree are, on average, three times more likely to have a job than those who have not finished secondary school. Among the employed, university-educated workers earn, on the whole, much higher incomes than their less-educated counterparts. But if these factors account for the rise of populism, they must have somehow intensified in the last few years, with low-skilled workers’ circumstances and prospects deteriorating faster vis-à-vis their high-skilled counterparts. And that simply is not the case, especially in Europe. In fact, higher education has provided significant labour-market advantages for a long time. Judging from the available data, the wage premium for workers in occupations that require high levels of education has been roughly constant in Europe over the last decade. While it has increased in some countries (Germany and Italy), it has decreased in others (France, Spain and the United Kingdom). Figure 1 shows the available data for the largest EU countries. 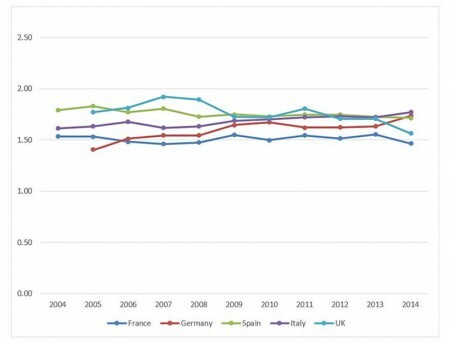 The difference in employment rates of the highly educated and the less educated has also remained relatively constant in Europe, with the less educated actually closing the gap somewhat in recent years (despite the deep and lingering recession, which is supposed to affect the less educated most). A comparison of the trends in the US and Europe further weakens the ‘losers of globalisation’ argument. The wage premium is substantially larger in the US (100-150%) than in Europe (50-80%). Yet the US economy is less open to – and less affected by – trade than the European economy is. 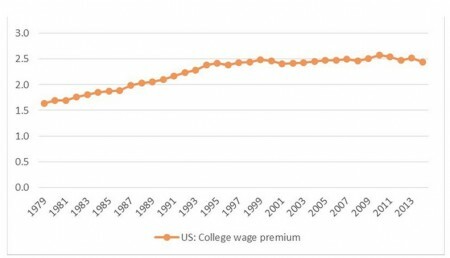 But even in the US, for which longer term data are available, the ‘college’ wage premium stopped increasing about ten years ago (see Figure 2). The final nail in the coffin of the globalisation-based explanation for the rise of populism in Europe is the fact that the share of low-skilled workers (who have not completed a secondary education) is declining rapidly. At the turn of the century, there were over 50% more low-skilled workers than university graduates. Today, university graduates nearly outnumber low-skilled workers in the work force in Europe; following the prevailing logic, the share of voters supporting anti-globalisation parties should be shrinking. A clear-cut economic explanation for a complicated political phenomenon is certainly appealing. But such explanations are rarely accurate. The rise of populism in Europe is no exception. Consider the situation in Austria. The economy is relatively strong, underpinned by one of Europe’s lowest unemployment rates. Yet Norbert Hofer, the leader of the right-wing populist Freedom Party (FPÖ) managed to defeat his competitors from both of the centrist establishment parties in the first round of the presidential election last month. Hofer’s main area of focus was immigration. The attraction to Hofer’s anti-immigrant rhetoric is telling, and mirrors a broader pattern across northern Europe. 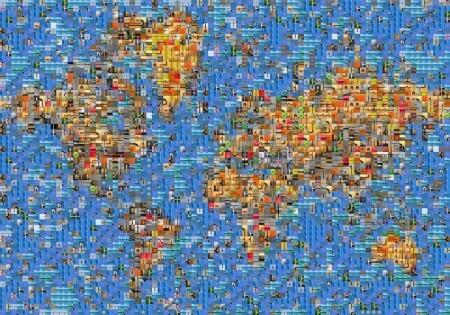 In the midst of relative economic stability, rising real wages, and low unemployment rates, grievances about the economic impact of economic globalisation are simply not that powerful. Instead, right-wing populist parties like the FPÖ, Finland’s True Finns, and Germany’s Alternative für Deutschland are embracing identity politics, playing on popular fears and frustrations – from ‘dangerous’ immigration to the ‘loss of sovereignty’ to the European Union – to fuel nationalist sentiment. Calling the rise of populism in Europe a revolt by the losers of globalisation is not just simplistic; it is misleading. If we are to stem the rise of potentially dangerous political forces in Europe, we need to understand what is really driving it – even if the explanation is more complex than we would like.